CRUMPLER GUARANTEE - WE GIVE YOU 30 YEARS. 30 YEARS GUARANTEE? SERIOUS? YES, SERIOUS! We are not only saying it - we mean it. Crumpler is producing great things. Our products are not only extremely good looking but also in top quality. And cause we're so damn sure about it we guarantee it. All bags are handmade and are subject to rigorous tests throughout the whole production process. We love our bags (would we name them otherwise?) and we want you to feel that love, too. Every day, as long as possible but at least 30 years. Guaranteed. However, real life is tough... sometimes more and sometimes less. If you have a damaged Crumpler product that you have bought directly via our website or our direct marketplaces and you wish to have it repaired and have your receipt, please send us an email to info@crumpler.eu including that receipt plus 1-2 pictures of the fault. We will then do our best to nurse your bag back to health. Should your Crumpler have come to you from a different place, please contact our repair team at repair@crumpler.de and they will also do their best to restore it back to its old glory. Please also make sure to include your receipt and 1-2 pictures of the fault. Detailed information on what is included in the 30 year guarantee can be found in our Terms and Conditions. HOW DO I TAKE CARE OF MY CRUMPLER BAG? You can do a number of things to make sure that your Crumpler bag looks the best it can. To begin with, here are a few things that won’t work. Never put a bag through the washing machine. Our bags are not meant to go through a spin cycle and therefore should also never be placed in a tumble dryer. The internal stitching and material can be affected by prolonged exposure to detergents and the heat of a tumble dryer will cause wet areas of the bag to wrinkle. Also it is hard for the padding to dry inside the bag after it has been completely immersed in water for a long period. Foam is porous and can trap water deep within itself when immersed and compressed. Think of it like a sponge, when you squeeze it in water it will absorb more. The biggest deteriorating factor to a Crumpler bag will be the gradual erosion of the water resistant coating applied to the outside of the Chicken Tex Supreme™. This is unavoidable, as prolonged rubbing on the surface will erode the coating. After a while you may notice that when rain falls on the bag, it no longer beads and falls off. To fix this, first clean the bag with a watery sponge and some shampoo. This will get rid of the grime and leave the fabric in the best condition. After cleaning, allow the bag to dry. Then apply an off-the-shelf water repellent spray, which is usually used for leather or outdoor jackets. Again allow your bag to dry fully before use and your coating will be as good as new. Orders placed before 12:00 (CET) will usually be dispatched on the same day. Delivery time is about 6 working days (dispatch within 3 working days + around 3 working days for DHL / carrier) from the time payment in full has been received. DO YOU DELIVER TO MY ADDRESS? WHAT ARE THE COSTS? You can find an overview of the respective shipping charges on our Shipping Info. We accept payments via Visa / MasterCard, PayPal, Bank Transfer, Sofortüberweisung and iDeal. HOW CAN I RETURN MY CRUMPLER PRODUCT? You can return your order up to 14 days after receiving it. See our Return Page to learn more about our Return Policy. HOW DO I FIND THE NEAREST CRUMPLER RETAIL STORE? We have 5 official Crumpler retail stores in Berlin, Hamburg and Cologne Germany. Take a look at the Store Locator to find your local Crumpler Store or dealer store, where you can see, touch and buy Crumpler products. Maybe you want to know how many people live in your street or even what laptop will fit in a Dinky Di. Either check the label, look at our Customer Service page....... or.... send all the questions to us and we will try really really really hard to answer them. .
Crumpler exclusively uses DHL and their local carrier partners to deliver your orders. Orders placed before 12:00 (CET) will usually be dispatched on the same day. Delivery time is about 6 working days (dispatch within 3 working days + around 3 working days for DHL / carrier) from the time payment in full has been received. Our service and distribution centre is closed on weekends, German public holidays and weekdays after 18:00 (CET). Deliveries to non-EU countries can incur additional duties, taxes and fees. 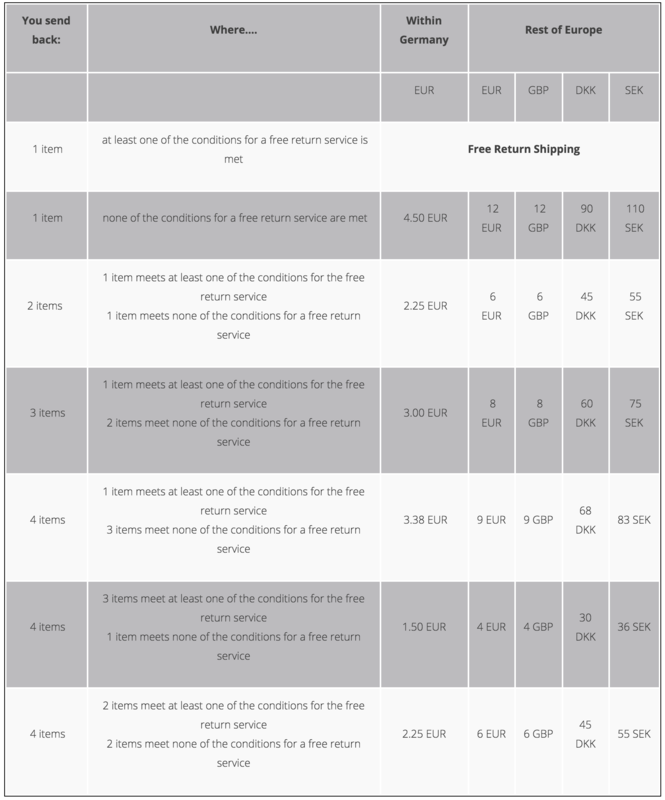 You can find an overview of the respective shipping charges in the table below. You will have to bear the direct cost of returning the goods, unless the individual product you are returning has a value of over 40 EUR/ 40 GBP / 300 DKK / 360 SEK, for which we will provide you with a free return shipping service, should you wish. Please contact us to arrange for your return label to be sent to you. You are only liable for any diminished value of the goods resulting from the handling other than what is necessary to establish the nature, characteristics and functioning of the goods. As outlined above, your return shipment is free if the individual product you are returning has a value of over EUR 40 / GBP 40 / 300 DKK / 360 SEK. If your return is not free of charge, a fixed amount of your refund will be deducted to cover the shipping costs (you will be advised of the amount when you request a return shipment). These instructions apply only to products sold directly by homepage over our website. IN WHICH CASES IS THE RETURN SHIPMENT FREE? 1. You have canceled the purchase of an item within the scope of the right of withdrawal within 14 days and the price of the returned item exceeds EUR 40 / GBP 40 / 300 DKK / 360 SEK (Note: The sum of EUR 40 / GBP 40 / 300 DKK / 360 SEK applies to each returned item and not to the total value of the return). For more information about this please see our terms and conditions. 2. You have received an incorrect, damaged or defective product. If you have used our pre-franked return shipping label for your return, the service is free in the above mentioned cases. WHAT DOES "PRE-FRANKED RETURN SHIPPING LABEL" MEAN? Returns from the above-listed countries should be dropped off up at your post office. The individual return labels are coded and valid only for the particular return to which they were issued. Please always use only one return shipping label per shipment and do not send back any products from different orders in one shipment to us. This complicates the processing of your refund. You can track the shipment process. If your return does not qualify for free shipping, a fixed amount from your refund will be deducted for the return costs. This charge will not exceed 4.50 EUR for returns within Germany (including value-added tax). When returning goods from other countries, this fee is EUR 12 / GBP 12 / DKK 90 / SEK 110 (including value-added tax). Please note: If multiple items in one shipment are returned, we reserve the right to charge a share of the return shipping costs for items that do not meet at least one of the 2 conditions mentioned earlier. You will receive a pre-franked return shipping label for your return. I BOUGHT MY BAG ON THE OFFICIAL CRUMPLER WEBSITE AND HAVE MY RECEIPT. When the article you wish to return has a value over €40, we will provide you with a DHL return label so that you can return the article to us for free. Please click here for your return label. If you have it at hand, please include a copy of the original invoice. I BOUGHT MY BAG AT AN OFFICIAL CRUMPLER RETAIL SHOP AND HAVE MY RECEIPT. Easy. If you are returning the product within 7 days of purchase, we can offer you a full refund against the price you purchased you bag for. If you are returning you bag within 14 days of the date of purchase we can make a product exchange equal to the value of the purchased bag. Please visit or contact your local Crumpler Shop in order to make the return or exchange. If you bought your bag more than 14 days ago, and have now changed your mind, unfortunately we cannot accept the return. Sorry. Products should be returned in the same condition to which they are purchased. They must be unused. Secondly, you can return your bag under our 30 year guarantee. If your bag is broken because workmanship, manufacturing faults or materials faults you can bring it to us for assessment for return. We will either fix your bag or in some circumstances provide you with the nearest replacement (some lines are discontinued and we can not insure a direct exchange). To ensure fast handling please please contact, or go to your local Crumpler Shop and they will be happy to help! I BOUGHT MY BAG AT AN OFFICIAL CRUMPLER RETAIL SHOP / WEBSITE BUT DO NOT HAVE THE RECEIPT. Nice, you picked one of our original Crumpler Stores or our Online Shop to make your purchase. Unfortunately we need the receipt as proof of purchase to be able to take product back, so you will have to love the product you have already bought....and next time, keep your receipt. I BOUGHT MY BAG IN A SHOP THAT SELLS OTHER BRANDS TOO (NOT A CRUMPLER SHOP) OR FROM A (NON CRUMPLER) ONLINE DEALER. Please contact your third party dealer directly to make the return. At this stage, we can only take 30 year guarantee returns, and return bags bought at our own retail or online shops. If you purchased your bag from our Official eBay Shop Crumpler Taschen, then you have 14 days to return your bag. Simply send an email to markets@crumpler.eu and let us know you would like to send it back. If you bought your bag from another eBay shop, then please contact that seller to return your bag. I FOUND IT ON THE STREET AND PICKED IT UP! Score! That is pretty lucky, but sorry mate, as we can not guarantee for the origin of this bag we can not take it back..
HMMM, I DON’T REMEMBER ANYMORE. If you cannot prove the origin of purchase, we cannot either, so unfortunately cannot take the product back. Sorry for that. CAN'T FIND THE ANSWER? CONTACT US! WIE BEKOMME ICH EIN RETOURENLABEL? CRUMPLER GARANTIE - WIR GEBEN IHNEN 5 JAHRE. Wir sagen das nicht nur so, wir meinen das auch. Crumpler macht tolle Sachen. Unsere Produkte sehen nicht nur extrem gut aus, sondern sind auch qualitativ absolut hochwertig. Und weil wir uns da ganz sicher sind, garantieren wir das. Alle Taschen sind handgefertigt und unterliegen einer ständigen Qualitätskontrolle. Wir lieben unsere Taschen und wir möchten, dass Sie diese Liebe spüren, jeden Tag, so lange es geht, aber eben mindestens 5 Jahre bei Vorlage des Kaufbeleges. Garantiert. Haben Sie Ihre Tasche direkt über unsere Webseite oder einen unserer direkten Marketplaces gekauft, dann senden Sie uns bitte die Kopie des Kaufbeleges sowie 1-2 Fotos vom Schaden an repair@crumpler.de und wir helfen Ihnen schnellstmöglich weiter, Ihr Produkt wieder fit zu machen. Ausführliche Informationen, was wir für Ihre Tasche im Rahmen unserer 5 jährigen Garantie machen können, finden Sie in unseren GESCHÄFTSBEDINGUNGEN. WIE PFLEGE ICH MEINE CRUMPLER TASCHE? Unsere Taschen sehen richtig gut aus und man kann einiges dafür tun, damit das möglichst lange so bleibt. Aber wie bei einem Haarschnitt, reicht es nicht, es irgendwie zu tun, man muss es auch richtig machen. Die Taschen gehören nicht in die Waschmaschine. Sie sind nicht dafür gemacht, einen Schleudergang mitzumachen oder in einem Trockner zu landen. Die Nähte und das Material können in Mitleidenschaft gezogen werden, wenn sie dauerhaft Waschmittel ausgesetzt sind und durch die Hitze eines Trockners kann sich das Material verziehen und Falten werfen. Außerdem ist es extrem schwierig, die gepolsterten Teile der Tasche wieder komplett zu trocknen, nachdem sie für längere Zeit vollständig durchnässt worden sind. Der für die Polsterung verwendete Schaum ist porös und schließt deshalb Wasser ein, wenn er vollständig unter Wasser getaucht und komprimiert wird – vergleichbar mit einem Schwamm der unter Wasser gedrückt wird. Ganz so wie bei einem natürlichen Alterungsprozess, gibt es eine Sache, die sich bei der Tasche im Laufe der Zeit verschlechtern wird. Die auf der Außenseite unseres 1000D Nylon Materials aufgebrachte wasserabweisende Beschichtung wird nach und nach abgetragen. Das ist ein ganz normaler Prozess und unvermeidbar, weil ständiges Reiben oder Scheuern der Oberfläche die Beschichtung abnutzt. Nach einer gewissen, allerdings sehr langen Zeit wird man feststellen, dass Wasser, das auf die Tasche fällt, nicht mehr wie gewohnt abperlt und abläuft. Das lässt sich aber wieder ändern. Dafür sollte die Tasche zunächst mit einem feuchten Schwamm oder einem weichen Tuch und evtl. mit etwas Shampoo gereinigt werden. Damit wird oberflächlicher Schmutz entfernt und das Material geschont. Die Tasche sollte man anschließend gut trocknen lassen. Danach kann man ein handelsübliches Textil-Imprägnierspray, wie es bspw. auch für Outdoor-Jacken benutzt wird, auftragen. Die Tasche danach noch einmal gut trocknen lassen und schon ist die Beschichtung wieder so gut wie neu. Auch können Kunststoffteile oder Kuststoffbeschichtete Textilmaterialien mit handelsüblichen Kunststoffpflegemitteln gereinigt und gepflegt werden. Bitte die Gebrauschsanweisungen der geeigneten Pflegemittel beachten. Bestellungen, die vor 12 Uhr aufgegeben werden, werden ca. noch am gleichen Tag in den Versand gegeben. Die Lieferzeit beträgt ca. 1-3 Werktage von dem Zeitpunkt des vollständigen Zahlungseinganges. Unser Versand- und Servicecenter ist an Wochenenden und Feiertagen und wochentags ab 18 Uhr geschlossen. WOHIN LIEFERT CRUMPLER? WELCHE VERSANDKOSTEN WERDEN BERECHNET? Wir liefern in folgende Länder: Belgien, Dänemark, Deutschland, Estland, Finnland, Frankreich, Griechenland, Irland, Italien, Kroatien, Lettland, Litauen, Luxemburg, Niederlande, Norwegen, Polen, Rumänien, Österreich, Slowakei, Slowenien, Spanien, Schweden, Schweiz, Tschechien, Ungarn, mit Ausnahme der Sondergebiete. Informationen zu den Versandkosten und den Sondergebieten sind unter dem Punkt "Versand & Lieferung" zu finden. Die Bestellung kann bis zu 14 Tage nach Erhalt der Ware zurückgeschickt werden. Ausführliche Informationen dazu finden Sie in der Rubrik "Widerrufsbelehrung". WO FINDE ICH EINEN CRUMPLER SHOP IN MEINER UMGEBUNG? Wir haben 3 offizielle Crumpler Shops innerhalb Deutschlands. Sie finden unsere Shops in den Städten Berlin, Hamburg und Köln. Hier können unsere Produkte angefasst und gekauft werden. Eine Übersicht aller Crumpler Shops sind im Crumpler Store Locator zu finden. Mit allen weiteren Fragen können Sie sich an unseren Webstore wenden und wir werden uns sehr viel Mühe geben, sie alle zu beantworten.